Implementing a pull system with Kanban can be extremely easy when you know precisely what needs to be done to get it started and keep it running. In the process of getting the hang of Lean management, you will learn that establishing a pull system of work is among the most important prerequisites to achieving optimal process efficiency. Pull is a powerful concept that will allow you to take control of your workflow and deliver value to your customers precisely when it counts. As we’ve already covered what a pull system is, we’ll show you how to establish and maintain one with the help of the Kanban method. Kanban is the original and by far the most popular method for applying a pull system. It was part of the Toyota Production System that brought attention to the lean way of managing work. What makes Kanban so perfect for running a pull system is its simplicity. The method is built on a short set of principles and values that are easy to teach and does not require a colossal change from the very beginning. There are 3 key steps you need to follow when you are preparing to apply a Kanban pull system to your process. They will most likely determine whether your implementation will be successful or not. Visualizing your workflow is the foundation of Kanban and a vital part of keeping your pull system efficient. You need to be as precise as possible when preparing your Kanban board. The default board setup consists of 3 sections representing the states of your products (requested, in progress, done). You need to carefully consider every part of your process and determine the steps of each stage. Typically, you would like to break down the In progress stage into as many steps as possible in order to have a comprehensive view of your workflow and spot any problems in an instant. After your boards are all set up and ready for action, you should stop pushing new work in your process and start pulling only when there is a demand for it. This will allow you to reduce the cycle time of your assignments by focusing on work that will bring value to your customers just in the right time. As a result, you will be able to increase the efficiency of your process and lower the inventory costs. Even if you pull new work when there is a demand for it, your process may get clogged and stay inefficient. 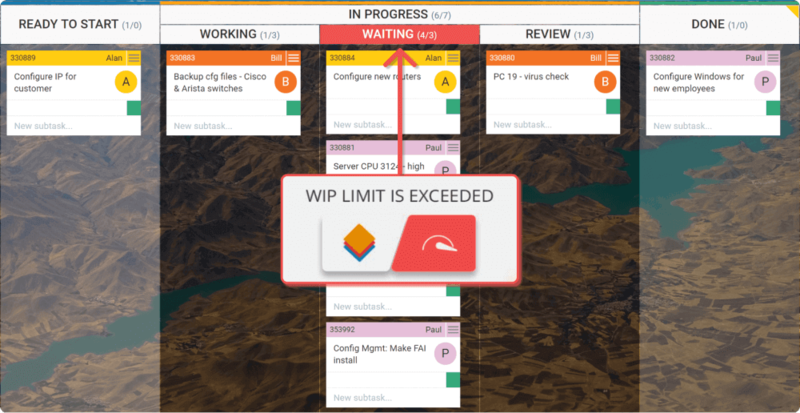 In order to be lean and make your Kanban pull system count, you need to control the amount of work that gets in and out of your workflow. For this purpose, you need to place limits on the work in progress (WIP) and make sure that your team complies with them. You may set up such limits per column or on a global scale for the whole board. Your goal here is to reduce the lead time of your products and make your flow as smooth as possible. In order for this to happen, you need to help your team focus. Encourage them to work on as few tasks as possible simultaneously in order to avoid switching context. After you’ve got your Kanban pull system up and running, you need to address another key aspect of Lean management – continuous improvement. As a manager, you need to keep a close look on your process and make adjustments whenever needed. Keeping your flow smooth and running, requires you to take good care of the cycle time of all cards that pass through your Kanban boards. As you would want to reduce cycle times as much as possible, we advise you to break down your work into tasks that require no more than a few days to process from requested to done. This will allow your team to pull work more often from one stage to another and therefore keep all parts of your process running. As a result, you will not only reduce the cycle times of your assignments but increase the throughput of your pull system. Pull signals will allow your team to understand when a task is ready to be moved on to the next stage of your workflow. In Kanban, the most simple way to apply such signals is to dedicate a few columns for the purpose. Simple examples of that are the review columns that you should place after every specific activity that needs to be evaluated. This will not only allow you to signal that a product is ready to move on to the next stage but will help you increase the built-in quality as you’ll be able to ensure that there are no mistakes in the production process. For example, in software development, you can break down your production process into 3 dedicated stages, tech design, coding, testing. Puting a review step after every stage will ensure that there will be no problem with the feature’s deployment. Placing a column “Ready for review” will signal the person responsible for the evaluation that they need to take action. Bottlenecks are an inevitable part of every process, no matter how advanced it is. They are a typical reason for failing to establish a smooth workflow. The problem with bottlenecks comes from the difference in capacity of the distinct stages of your workflow. For example, if you’ve got 10 developers working on your new product release and only one person responsible for the code review stage, it will be no surprise that this will likely be your bottleneck stage. Often the real problem with managing bottlenecks is that they are not visible. However, if you’ve mapped your workflow precisely on a Kanban board they should be recognizable at first sight. After noticing that a stage is becoming a bottleneck, you should waste no time and investigate the root cause of the problem. Afterward, you should take the proper measures to either remove the bottleneck completely or take action to prevent it from clogging your process and obstructing your flow. 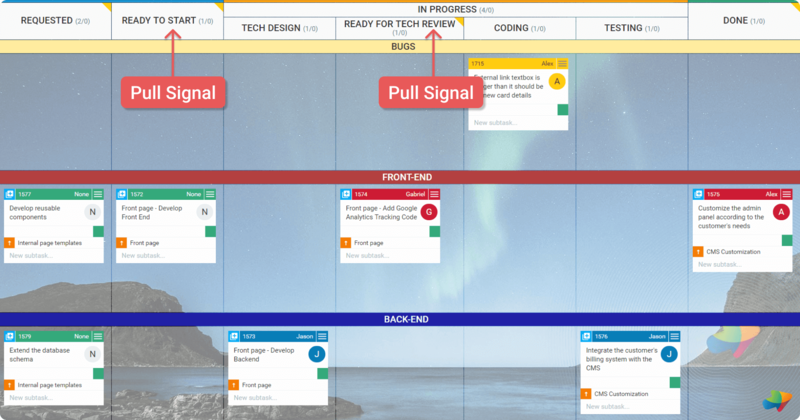 Map your workflow on a Kanban board. Break down large assignments into smaller tasks. Apply pull signals to your Kanban board. Manage your bottlenecks so your flow never gets stuck.